This Autumn has been one of the most colourful I've seen here in the Central Tablelands of NSW. Russet, garnet, butterscotch and gold leaves bedeck trees in many gardens and lawns carry mantles of colour. I wonder if the prolonged dry spell is the reason for all this glory. The weather continues to be warm and sunny but distressingly dry. It's wonderful weather for being outside gardening. Six on Saturday continues apace with gardeners showing what is happening in their plot. If you would like to see what others are experiencing in their gardens, pop over to The Propagator's blog to take part. Following an inspirational post about geraniums from Ali over at The Mindful Gardener, I visited our local nursery and bought one. It was the only one available, actually. She's Geranium hybrid x wallichianum 'Rozanne' which is a long name for a tiny plant. What an ethereal blue she is with her finely drawn darker veins. I've found a sheltered spot and hope Rozanne does well. 2. Unidentified Pelargonium. I love the brilliant colour of this pelargonium which is much stronger in real life than in my photo. When the frosts arrive, this plant will be badly affected, but is sheltered enough to survive the winter, its burnt and battered outer leaves protecting those underneath. 3. I planted this Arum pictum last year having read that it is quite self-contained and sensible and won't spread wantonly. However, it looks to me as though it's indulging in some sneaky thuggery. 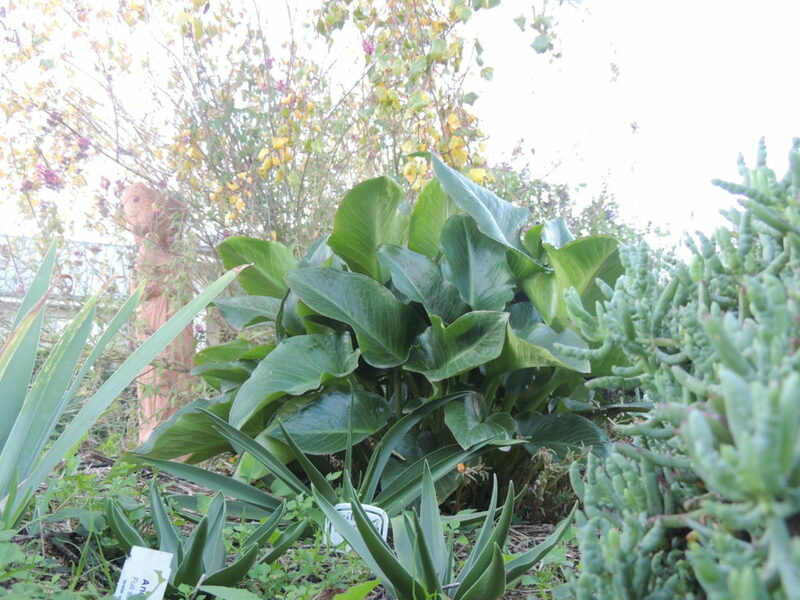 You can see it's grown quite large in a short period of time and is about to lean on my Scilla peruviana which has been producing strong healthy leaves. The flowers are interesting but the flowering period is very brief. I wonder if anyone else has had experience with this plant? 4. Verbena bonariensis. Planted as an infant a month ago, 75 cm tall and flowering already. 5. 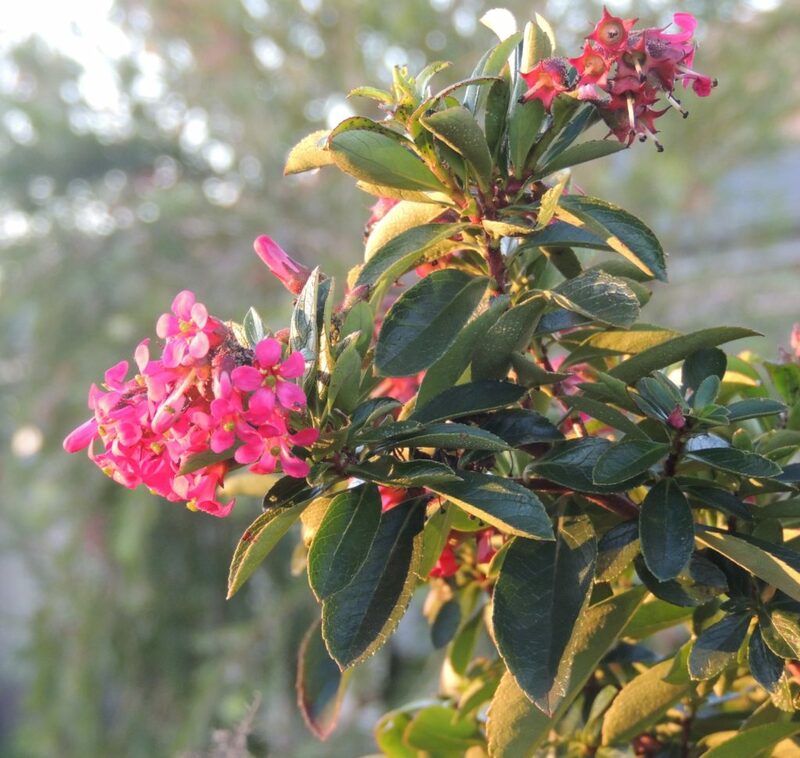 Late afternoon sun shining on standard Escallonia. It has a terrible aphid infestation which seems to be common to these plants. 6. 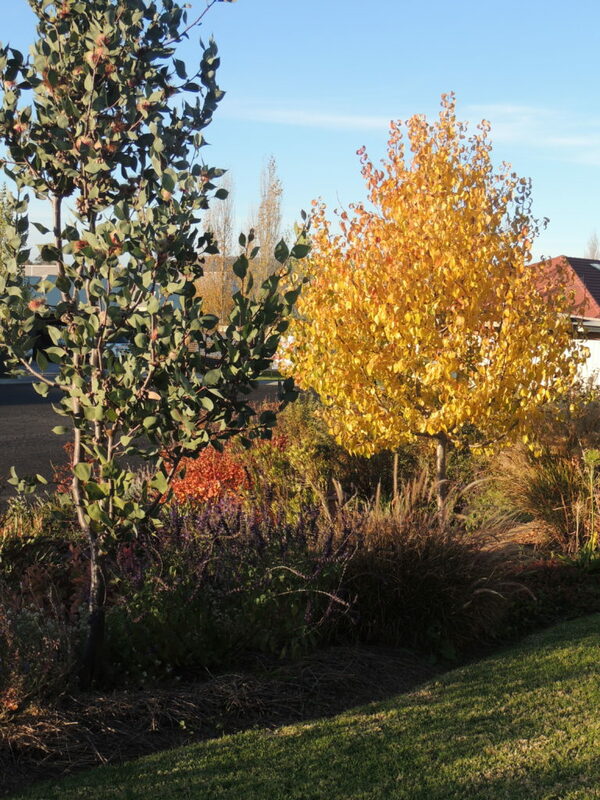 In the front garden, Pyrus nivalis the Snow Pear, is clothed in leaves of gold. This is the best colour I've seen it display since it was planted three years ago: again, perhaps the effect of our dry Autumn. Weather today: 1.3 - 21 degrees C and sunny. I love geraniums. They’re so hardy and forgiving and always put on a pretty display. I’ve never seen one in that beautiful colour though. It’s gorgeous. Thanks Carol. It’s an even stronger colour in reality, and that’s why I like it. What your Arum have beautiful and healthy leaves! You don’t have slugs over there? You’re lucky … I also like escallonia but they need a warmer climate and the south of France is better for that. I enjoy seeing them there. Yes Fred, we do have slugs, and snails by the thousand, but it has been so dry that they’ve all closed down until the next rain! Thank you Lis. I’m hoping my verbena will self seed. I’ve already grown one cutting from that little plant- a bit broke off so I put it in a pot and away it went. Is that a sign of something that’s going to be a nuisance, I wonder? Yes, Pauline, where is all that rain going? Just catching up on reading after knee surgery. Probably won’t get to those I’ve missed. I’m surprised that your Pelargonium will survive winter outdoors. Are your winters dry? I think it would be wet as much as cold that did for them here. ‘Rozanne’ is such a good plant, almost nothing flowers as well and for so long. Hi Jim, I’ve had that pelargonium for about three winters. I’m not sure why it survives- can only think it’s covered up enough by other leaves that it’s sheltered from frost. Winters can be wet or dry: there’s no knowing what we’re going to receive. Winter rain used to be common, but hasn’t really happened for a few years. Perhaps you could go out in your garden and take six photos, Tracy! New challenge? 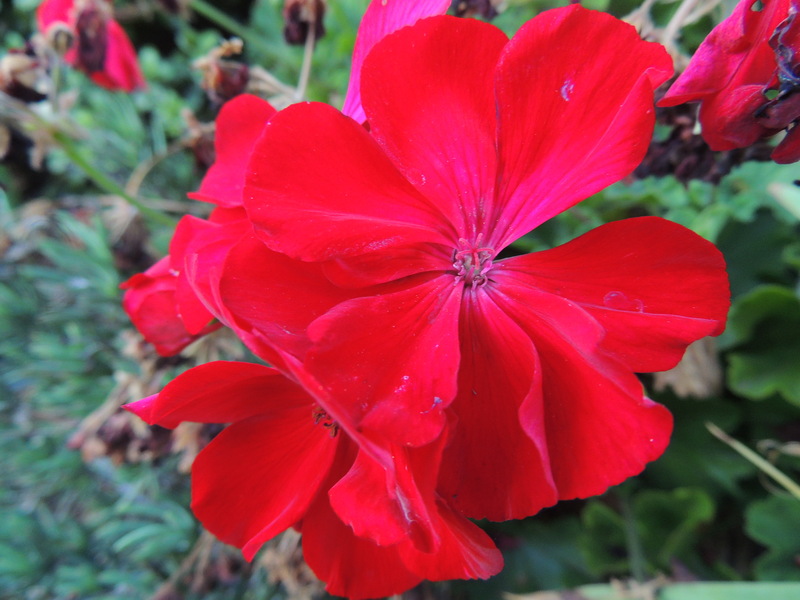 Glad you have joined the perennial geranium fan club – they are very good value. I do like verbena bonariensis, the only trouble I found was that it produced so many seedlings which sounds good but most were in the cracks between my small patio slabs! They were a pain to get rid of. Maybe I will try again at the back of a flowerbed. I expect I’ll find out next spring whether the verbena is going to be a nuisance…I suspect it will be! Ah, I’m glad you found ‘Rozanne’. I should have known she would be the globe-trotter! Your autumn leaves are stunning. I still find it odd that you can be in autumn whilst we are in spring. This planet is an incredible place. ‘Globe trotter’ I love that! I’m glad to hear about the poinsettia, Jo. 21C – bliss! Your colours are wonderful, warming me up on this miserable day. I love Rozanne, she is a beauty and flowers non stop here. Hope you get a little rain soon. Thank you Gill, and thank you for your rain wishes too. There’s a bit forecast on Wednesday, but I don’t think it’s very much. I do miss my garden (or rather my ex’s garden) but I am glad to have yours to look at every week. That’s nice, John. Thank you. You’re made a good choice or been lucky to find ‘Rozanne’ . From everything I read about it; it flowers over a very long period but doesn’t push everything else out of the garden. Your autumn colour looks great. Thanks Christina. I hope my Rozanne gets her roots down enough before the nights get really cold. Lovely Rozanne. I have a beautiful blue one too, but I don’t know her name. So far only my pink geraniums are flowering. And I am also astonished that your pelargonium survives frost! I brought most of mine in this year over winter and the ones I left outside were killed by the cold temperatures and the snow. Luckily I had taken cuttings. I’ve been lucky so far with the pelargonium, Jude, and we had heavy frosts last winter. I know they’re easily replaced, but I do like the strong red of mine. I should take some cuttings too. Perfect hardy geranium choice! I grow plenty of Rozanne and she is polite. Love the last photo of your fall colors. 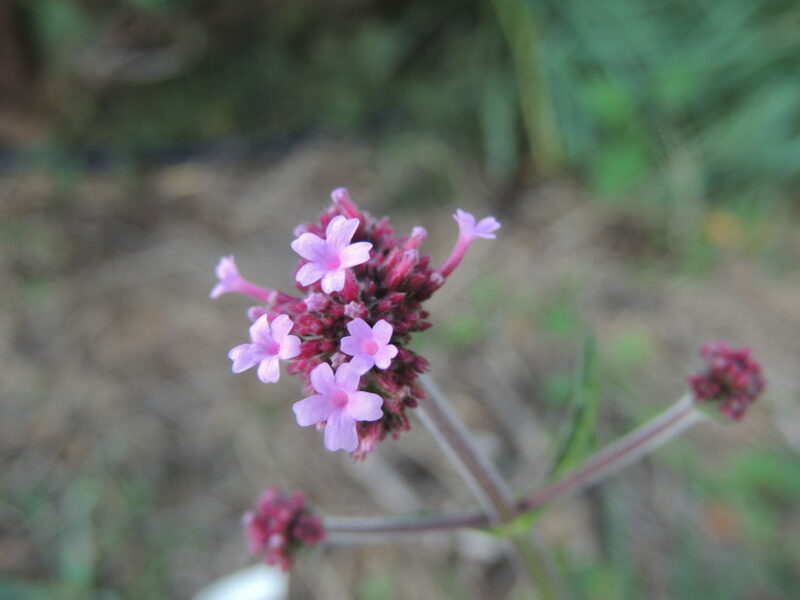 Does that verbena have a fragrance? She looks like she might. The verbena’s scent is almost undetectable, but that’s ok because it’s a pretty little flower and the plant will fill spaces in the garden. Jane, these pictures are beautiful, here where I live there are too many evergreen trees so I don’t see many red-yellow autumn colours. Have a great weekend! Thank you Marcelo, nice to hear from you. Happy Sunday to you! I have been looking for a purple geranium to go with my existing pink so may follow you in buying Rozanne – a lovely variety. Rozanne would look perfect with pink. I’m somewhat surprised to see you get autumn color, Jane. I think of your climate as more like mine and, unlike the eastern part of the US, we get almost no fall color. I hope ‘Rozanne’ does well for you. I’ve always adored that plant but while it grew relatively well in my former shady garden, I’ve failed twice to get it established in my current garden, just 15 miles further south. I don’t think it likes the strong winds or the drought-related dryness of our soil. I thought of your climate as being like mine too, Kris, especially as we grow a lot of the same plants. Maybe it’s the altitude that makes the difference. Don’t be disheartened if V bonariensis doesn’t self seed straight away. I’ve had it for years and never had anything from it. Then all of a sudden it takes off. This year I’m overrun, even after (perhaps because) our hard winter killed off all the top growth. It’s such a fab plant though I don’t mind having loads! Thank you for that advice, Jessica. I’ll be happy if mine sets seed, and if it doesn’t I’ll grow cuttings. Glad to hear it’s a worthwhile plant. That rozanne is a goodun. I need a few of those. I picked up a few hardy geraniums at the plant fair yesterday, but no rozannes. Rozanne has already produced a few more flowers since I planted her! Jane, I’m glad you’re enjoying a colorful autumn. Those are the best. 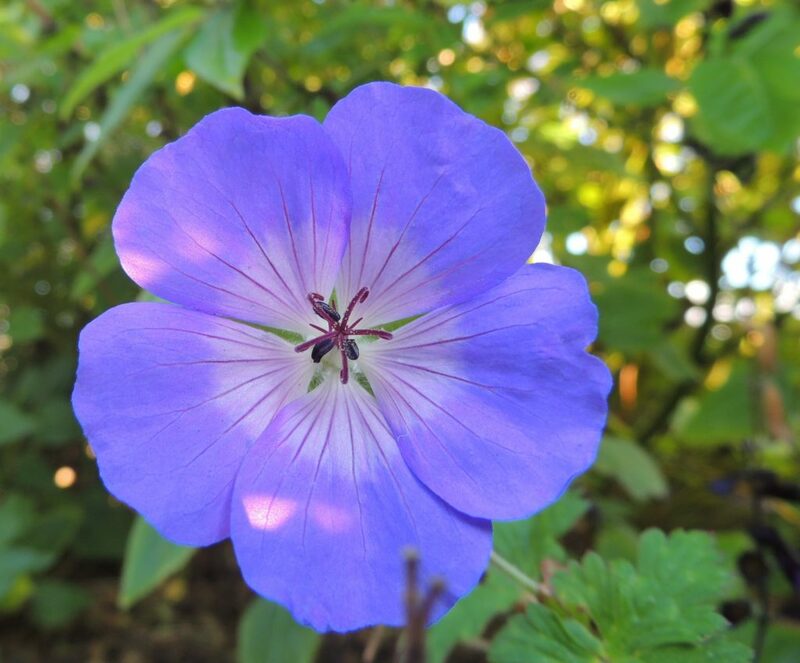 I’ve never seen a blue/purple geranium, but I’m in love with that color. May she thrive in your lovely garden. I’m sorry to hear about your drought. I was just commenting about our five year California drought in your comment on my blog, and here you are discussing the same. Fingers crossed for some rainfall. Thank you Alys. We have rain forecast overnight, but I don’t think it will be much.